I recently received a complimentary review copy of Donna-Marie Pye’s “Easy Everyday Slow Cooker Recipes” from publisher, Robert Rose. 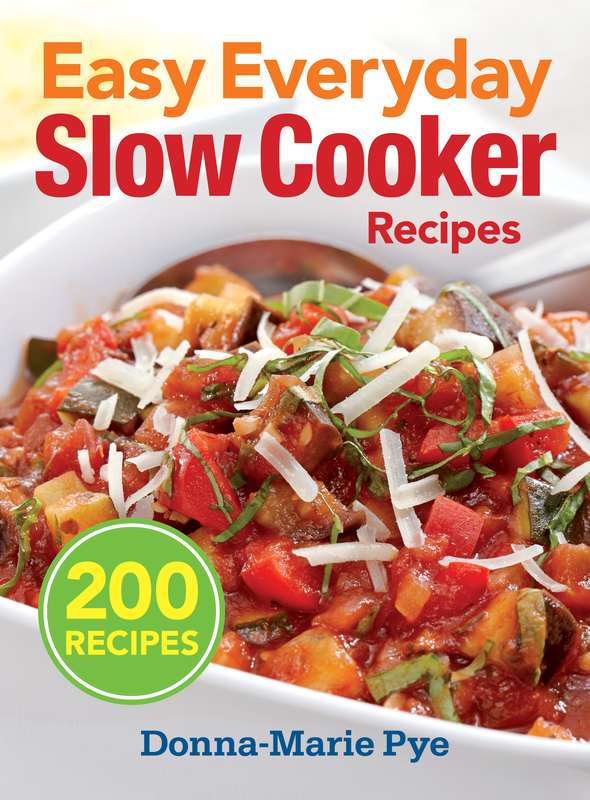 This compendium of 200 recipes is, in my view, really the only slow cooker recipe book the home cook needs as it contains a vast variety of taste-tempting recipes. Divided into 10 chapters, the recipes are conveniently and logically grouped: Soups; Stews: Chilis and Beans; Poultry; Beef and Veal; Pork and Lamb, Big-Batch Dinners for a Crowd; Meals for Two, Double-Duty Dinners; and Desserts. There is also a complete index of recipes in the back of the book. While there aren’t photos to accompany every recipe, there are over 75 full-page, color photographs and they are well-executed and of high quality. The first 21 pages of the book are dedicated to explaining the construction of the slow cooker along with handy and useful tips on cooking with the counter top appliance, adapting conventional recipes for use in slow cookers, and information on food safety. Undoubtedly of use to even seasoned home cooks, this segment of the book would be particularly useful for those unfamiliar with slow cookers. I recommend reading these pages before starting to make any recipe from the book as they contain some great “meat”. Each recipe is well laid out with print font that is easy to read. Ingredients are listed in the order in which the directions call for them which facilitates preparation. Ingredient amounts are given in both imperial and metric measurements. Directions are described in easy-to-follow, step-by-step method. Each recipe is accompanied by a friendly lead-in paragraph. As well, each recipe also has a “Tip” box on the page so the book becomes a self-teaching tool for the home cook. Look for tips on serving suggestions, liquids to tenderize meats, ingredient substitutions, and other useful hints for cooking with a slow cooker. In addition, with many of the recipes, there is also an explanation of any special ingredients the recipe may use. For example, this might include a description of fennel and how to prepare it for use or what certain foods, like tamari, are used for. Each recipe also gives its yield in terms of number of servings the recipe is expected to generate. In terms of ingredients, I found most recipes call for easy-to-find ingredients that are likely to be available in most large supermarkets. However, there are a few recipes that call for ingredients that are unfamiliar to me – for example, sambal oelek or edamame – but these recipes are the minority in the book. For the most part, ingredients are inexpensive with the exception of the meat called for in any recipe. As with any recipe, I recommend pre-reading each recipe carefully before beginning preparation to ensure you have all the necessary ingredients and/or that they are ones you can source in your area. Some recipes do incorporate more contemporary/trendy ingredients such as balsamic vinegars, roasted red peppers, fennel, and salsa. In my view, the quantity of ingredients (particularly spices and flavourings) called for in the recipes is reasonable and the instructions are clear in terms of explaining if an item is to be finely or coarsely chopped or minced, whether to include liquid with contents of a canned ingredient, and the size of pieces into which the meat or vegetables are to be cut. One of the things I like most about this book is the section on meals for two as not many recipe books include scaled-down recipes for the smaller household. I recently made the Country Italian Beef Stew for which the publisher is allowing me to share the recipe and photo along with my review (recipe follow below review). This is a yummy stew with a delicious brown sauce/gravy and is one I will definitely make again. This was also the first time that I cooked with a fennel bulb. Not being familiar with whether all fennel bulbs are the same size or not (the recipe called for one fennel bulb), I erred on the side of caution and used only a good half of the bulb in case I didn’t like it. However, I loved it – it has a subtle but not overpowering fennel flavour. 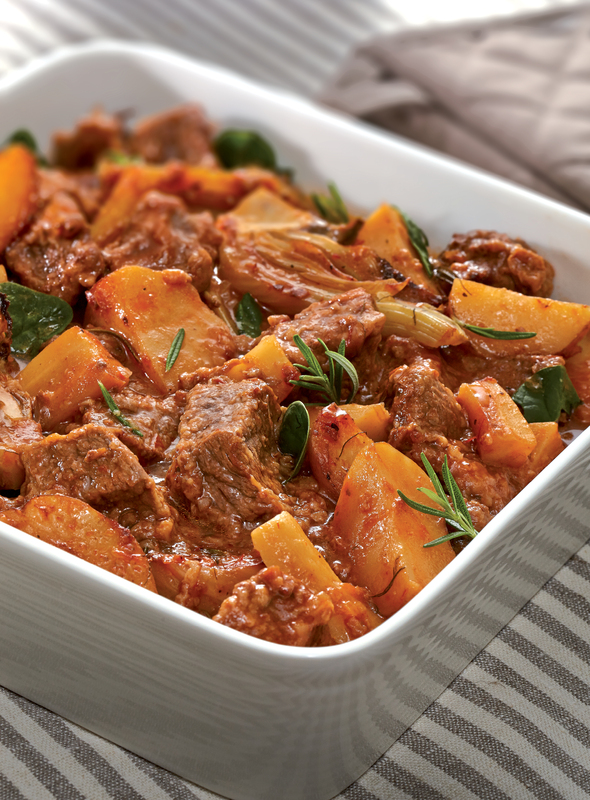 This stew has good flavour and texture and reheats well, too. I like this book. Very much, in fact, and it will make its way on to my crowded, and now premium-spaced, recipe bookcase and I will use the book as it contains many taste-tempting recipes. Retailing for $24.95 (US$)/$27.95 (CDN$), I feel this book is reasonably priced for its content and quality. If you are a committed slow cooker user, I think you’ll find this a wonderful inspiration for many meals and, if you are new to slow cookers, I believe you will find a number of new recipes to add to your meal preparation. Disclosure: I received a complimentary copy of Easy Everyday Slow Cooker Recipes from Robert Rose Inc for the purposes of conducting a review of the cookbook. I received no compensation for this review and was under no obligation to provide a positive review. All opinions expressed are purely my own. The following recipe is courtesy of Easy Everyday Slow Cooker Recipes by Donna-Marie Pye, 2014 © www.robertrose.ca Reprinted with publisher permission. Available where books are sold. This stew features the wonderful flavors of the Mediterranean — fennel, basil and rosemary. Fennel has a distinctive mild licorice flavor, but even if you are not a licorice fan, you will enjoy the bold flavors of this beef stew. 1. In a heavy plastic bag, combine flour, salt and 1⁄2 tsp (2 mL) of the pepper. In batches, add beef to bag and toss to coat with flour mixture. Discard excess flour mixture. 2. In a large nonstick skillet, heat half the oil over medium-high heat. Cook beef in batches, adding more oil as needed, for 5 minutes or until browned all over. Using a slotted spoon, transfer to slow cooker stoneware. Stir in potatoes, parsnips, fennel and onion. 3. In a 2-cup (500 mL) measuring cup, combine broth, wine, pizza sauce, garlic, rosemary and the remaining pepper. Pour over beef mixture. 4. Cover and cook on Low for 8 to 10 hours or on High for 4 to 5 hours, until bubbling. Just before serving, stir in spinach until wilted. Tip: Crush dried rosemary between your thumb and fingers before adding it to a dish. This helps release the full aromatic flavor of the herb.